Man with a Hoe (1862) by Jean-Francois Millet. Among the greatest modern paintings of the nineteenth century. Location: J. Paul Getty Museum, LA. Millet was a founder member of the Barbizon School, an informal group of landscape painters living near the Forest of Fontainebleau south of Paris. Barbizon painters developed a particularly true-to-life form of Naturalism, an idiom that - in Millet's case at least - led to a style of rural realist painting which ignored many of the canons of academic art and drew attention to the harsh working conditions of the peasantry. It is these pictures, exalting the world of peasants and rural labour, for which Millet is best-remembered. Indeed they represent some of the great genre paintings of the 19th century, and - along with works by Gustave Courbet - constitute the first appearance of modern art - in the sense of paintings that deal with modern issues. 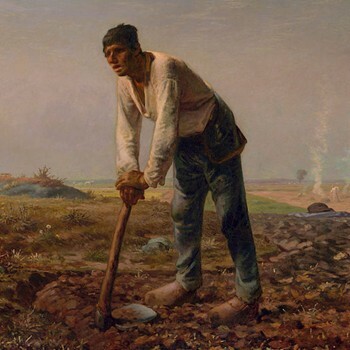 Millet's signature style of French painting is exemplified by works like: The Winnower (1848, National Gallery, London), The Sower (1850, Museum of Fine Arts, Boston), The Gleaners (1857, Musee d'Orsay), The Angelus (1857-9, Musee d'Orsay) and The Man with a Hoe (1862, J.Paul Getty Museum). Compare the key works of Courbet, such as: A Burial at Ornans (1850) and The Artist's Studio (1855). For more background about how Realism influenced other movements, see: Realism to Impressionism (c.1830-1900). From about 1850 onwards, Millet began to establish an international as well as a national reputation, as one of the leading Realist artists in France. His success allowed him to acquire prints and drawings by artists he admired, including Pieter Bruegel the Elder (1525-69), and Rembrandt (1606-69), as well as the nineteenth century Romantic Eugene Delacroix (1797-1863). The detailed realism of these painters' works were great inspiration for Millet's images of agricultural laborers. In addition he was a keen collector of 19th century photography, notably unposed snapshots of local people. See also: History of Photography (c.1800-1900). The grinding hardship of peasant life comes largely from the constant cycle of the seasons and the backbreaking tasks associated with each of them. For example, the moment the harvest is gathered in and stored away, it becomes time to prepare the fields for replanting. But before they can be ploughed, they must first be cleared of weeds and stubble. And in France of the 1850s, this clearance was done by means of a tool called a hoe. This heavy implement, not unlike a giant adze, with a blade as wide as a shovel, is particularly fatiguing to use and requires enormous stamina: even the strongest labourer finds hoeing wearisome and needs regular breaks. The labourer in Millet's painting is no exception. Resting on his hoe, still panting from his exertions, he pauses for a moment's rest. Covered in sweat and wearing only his vest, a pair of rough trousers and clogs - he discarded his jacket and hat some time ago - he keeps his sleeves rolled down to protect himself against the hot sun. His face and neck are already a deep brown while his lips appear cracked and dry. The blank expression on his face is devoid of all vitality, signalling a man near the end of his strength. Standing in a rough and lumpy field, overgrown with brambles, stubble and tufts of grass, he is hoeing the ground all by himself. In the background, several bonfires of unwanted foliage are burning away, sending up columns of smoke. The agricultural labourer himself is tall, wooden and brutish. He has no redeeming features to speak of, except perhaps an intense weariness. His unattractive physiognomy is similar to that of The Sower (1850) and The Gleaners (1857), but (like them) he is not ugly. There is a quiet solidity, and dignity, about him. This contradicts those art critics who claim that Millet focused his attention on the ugliness of the working classes. Indeed, Millet's works are devoid of sympathy and sentimentality and seek only to honour the working man and his environment. Aesthetics do not come into it. He merely followed the seasons and painted what he saw, without imposing any ideas about what should or should not be. Peasants tilled the soil and Millet painted them. It was that simple. As the Bible says (Genesis 3:19) "Thou shalt eat thy bread in the sweat of thy brow, till thou return unto the ground, for out of it wast thou taken; for dust thou art, and unto dust shalt thou return." Millet's genre works impressed many progressive painters and set a trend which was later developed in works like: The Floor Scrapers (1875) by Gustave Caillebotte; Roadmenders in the Rue de Berne (1878) by Edouard Manet; Woman Combing Her Hair (1887-90) by Degas; and The Card Players (1892-6) by Cezanne.  Women in the Garden (1866-7) by Monet.  The Balcony (1868) by Edouard Manet.  Absinthe (1876) by Edgar Degas.  Path Leading Through Tall Grass (1877) by Auguste Renoir.  Bathers at Asnieres (1883-4) by Georges Seurat.  For analysis of other Barbizon Realist paintings, see: Homepage.